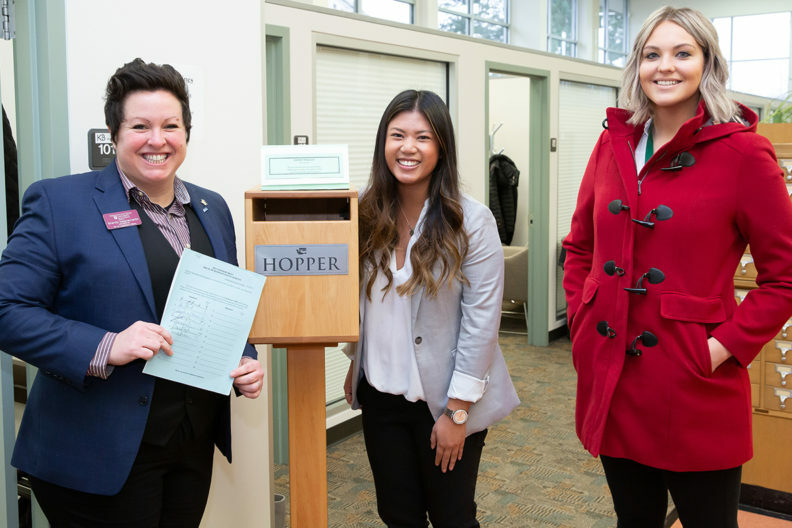 Brandy Seignemartin, left, and Johanna Pantig, center, dropped a legislative proposal into “The Hopper” in the Office of the Code Reviser in Olympia in late January. The two third‑year students at the WSU College of Pharmacy and Pharmaceutical Sciences worked on the legislation in their roles with the Associated Students of WSU Health Sciences. Kylie Peterson, right, is executive legislative assistant to Rep. Marcus Riccelli, D‑Spokane, who’s the lead sponsor of House Bill 1726. Rep. Marcus Riccelli, D‑Spokane, is the lead sponsor of House Bill 1726. It would amend state law to allow pharmacy, medicine and nursing students to be supervised by preceptors from any of those professions while taking vital signs at health fairs and other such volunteer activities as long as the care provided is within the proper scope of practice. For example, nursing, pharmacy and medicine students all would be able to give immunizations at a community clinic under the supervision of a licensed professional from any one of those disciplines. Under current law, there would need to be a licensed pharmacist, physician and nurse all present as preceptors at such an interprofessional clinic. “Last year I went to an immunization clinic, and I had a pharmacy preceptor there so I was able to give immunizations, but there were three nursing students who ended up having to go home because their preceptor got sick at the last minute,” said Johanna Pantig, president of the Associated Students of WSU Health Sciences and a third‑year pharmacy student. That doesn’t serve students or the community well, said Pantig and Brandy Seignemartin, vice president of legislative affairs for the student‑government group, also a third‑year pharmacy student. Students want hands‑on experience, they want to serve the community, and they’re especially looking for interprofessional experiences, they said. Similar legislation was introduced in 2015, but it didn’t go anywhere. This time, Seignemartin, who Pantig credits with much of the ground work on the current bill, contacted stakeholders in pharmacy, nursing and medicine to address their concerns. She and two others — first‑year med student Erin Kaya and third‑year pharmacy student Lauren Powell — approached Riccelli about sponsoring the legislation. The bill was introduced on Jan. 29, but it has a long way to go to become law. Still, the experience has been memorable for the WSU students who worked on it. Both Pantig and Seignemartin envision a future that includes advocacy, they said.